1995-09-09. New. Ships with Tracking Number! INTERNATIONAL WORLDWIDE Shipping available. Buy with confidence, excellent customer service! New York: Praeger Publishers. 1973. Book Club Edition. Hardcover. Very Good+ in a Good dust jacket. Previous owner inked front endpage. Ill fitting panels. Shelf wear to panels. Wear to crown and heel. ; 8vo 8" - 9" tall; Original dust jacket protected by archival Brodart cover. All domestic orders shipped protected in a Box. .
New York: Praeger Publishers. 1973. Book Club Edition. Hardcover. Near Fine in a Very Good dust jacket. Closed tears with creasing to front panel's upper and lower edges. Closed tears to crown and heel of spine. Front flap ill-fitting. Publisher's notes neatly laid-in. ; 8vo 8" - 9" tall; Original dust jacket protected by archival Brodart cover. All domestic orders shipped protected in a Box. .
Hippocrene Books. Hardcover. 0880294027 New Condition. . New. New York: Praeger Publishers. 1973. Hardcover. Near Fine in a Very Good+ dust jacket. Edge wear. Soiling to front and rear panels. ; 8vo 8" - 9" tall; Original unclipped dust jacket protected by archival Brodart cover. All domestic orders shipped protected in a Box. .
New York: Praeger Publishers. Very Good+ in Very Good+ dust jacket. 1973. Cloth. An attractive edition in Very Good+ condition with soiling to the boards and pages and light edgewear in alike dust-jacket with some soiling and edgewear ; . New York, Praeger Publishers, 1973. First Edition. Fine cloth copy in a near fine, very slightly edge-nicked and dust-dulled dw, now mylar-sleeved. Remains particularly and surprisingly well-preserved; tight, bright, clean and sharp-cornered. ; 623 pages; Description: xiii, 623 p. 25 cm. Bibliography: p. 607-612. Subjects: Hitler, Adolf (1889-1945) ..
New York : Praeger Publishers, 1973. 2nd printing, 1973. Fine cloth copy in a near fine, very slightly edge-nicked and dust-dulled dw, now mylar-sleeved. Remains particularly and surprisingly well-preserved; tight, bright, clean and sharp-cornered. ; 623 pages; Description: xiii, 623 p. ; 25 cm. Bibliography: p. 607-612. 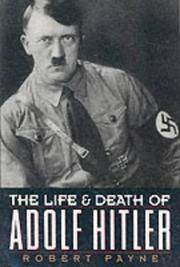 Subjects: Hitler, Adolf (1889-1945) --Biography. Corgi. PAPERBACK. 0552097837 Note! Very rough reading copy. Missing dust jacket. Please read before purchase: This book has extreme wear and is not pretty; still usable. Has lots of wear. Meets the acceptable condition guidelines. Five star seller - Buy with confidence! . Fair. New York: Praeger Publishers, 1973. very good, fair to good. 623, illus., endpaper maps, appendices, chronology, notes, bibliography, index, DJ spine worn along edges & small tears. Praeger. Used - Acceptable. 1973 Hardcover . xiii, 623 p. Bibliography: p. 607-612. Shows definite wear, and perhaps considerable marking on inside. Praeger. Used - Good. 1973 Hardcover . xiii, 623 p. Former Library book. Bibliography: p. 607-612. Shows some signs of wear, and may have some markings on the inside. Praeger. Used - Good. Ships from Reno, NV. Shows some signs of wear, and may have some markings on the inside. 100% Money Back Guarantee. Shipped to over one million happy customers. Your purchase benefits world literacy! New York: Praeger Publishers, 1973. good, fair to good. 623, illus., endpaper maps, appendices, chronology, notes, biblio, index, DJ scuffed, water stained, worn along edges, & small tear. Praeger. Used - Good. Ships from the UK. Shows some signs of wear, and may have some markings on the inside. 100% Money Back Guarantee. Your purchase also supports literacy charities. New York: Praeger, ( 1973). First edition. Hardcover. Fine/fine. 8vo, 623 pages, red cloth Signed by Payne on the first blank leaf for Kroch's & Brentano's First Edition Circle. Payne was the son of an English father and a French mother. Rudolf Hess introduced Payne to Hitler in 1937. New York: Praeger, 1973. Hardcover. Fine/Fine. Hardcover in dust jacket. 1973 book club edition. Book and unclipped dust jacket are in fine condition, crisp and clean, with tight binding and sharp corners. Historic photos and documents throughout. 8vo. 623 pp. including index. In protective Mylar. Heavy for international shipping. Hippocrene Books, 1990-03-01. Hardcover. Used:Good.